Lock Picking: We have a huge variety of padlocks liberated from the Halfpenny Bridge, we’ll show you how to open them. We also have more esoteric locks, handcuffs, practice locks, and the tools and know-how to pick them. Workshops on Mondays, the 1st, 15th and 29th October, starting at 7pm. Coding: Come into Tog and work on a project, or help others with theirs. Laptop of your own pretty much essential, and bring your own project. We provide the space and the wifi, and some expertise. Runs on Mondays, the 1st, 15th and 29th October at 7pm. Craft Night: Ranges from knitting, sewing (we have machines), crochet, and embroidery to 3D printing and laser cutting. Bring along a project, work on something you know, or learn a new skill. Runs on Wednesdays, the 3rd, 17th and 31st October at 7pm. Electronics and Micro Controller Night: Learn how to make Arduinos, Raspberry Pis and Intel Galileos do cool and interesting things, or try our introductions to electronics worksheet. We don’t have spare laptops, so bring your own. Runs on Mondays, the 8th and 22nd October at 7pm. Wikipedia Editing: On the 31st October at 7pm, you can learn how to add your knowledge to the world’s largest open collaborative knowledge project, by becoming a Wikipedia editor. Everyone welcome and no prior experience is necessary. There is pizza, to go with the cake. Open Social: This month, the open social is on Saturday 20th October at 7pm. Pizza, beer, conversation, games, starts early evening and, like the best parties, doesn’t end until the last person leaves. This was written by Joe Citizen. Posted on Monday, October 1, 2018, at 8:29 pm. 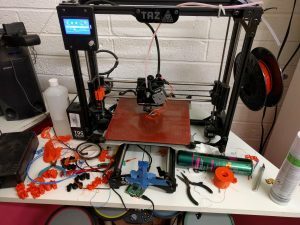 Filed under 3D printing, Advocacy, Calendar Event, Coding, Craft, Lock Picking, News, Open evening, Social Night, Workshops/Events. Tagged book club, Coding, crafting, electronics, lock picking, lockpicking, October 2018, open event, social night, wikipedia editing, Workshops/Events. Bookmark the permalink. Follow comments here with the RSS feed. Post a comment or leave a trackback.